Pleasure is my business, my life, my joy, my purpose. This is going to be a new feature here on Purveyor of Pleasure, and I thought I would start it off! Normally the title would be “What Brings You Pleasure” (now a link in the navigation bar as well) but since I’m writing it this first one is What Brings Me Pleasure. This post and this idea, really, is brought to you by the image above from Adipositivity, possibly my favorite photography site ever. I’ve posted many times about and many pictures from Adipositivity and I’m sure I will post many more. I was inspired by the photo to write about my love for hammocks, and that brought me to the idea of this new feature! If you would like to submit a post for this new feature check out the info page. I’m not really sure what it is about hammocks that I love so much. I’ve always loved gently rocking back and forth while being suspended in the air. I remember when I was little my Aunt and Uncle had a little storage shed across from their house that my Uncle had built. On the poarch of the shed a gorgeous rainbow hammock was suspended in the spring and summer. Every time we went over there, if there was time, I would ask if I could play in the hammock. I would climb into it and just lie there, rocking back and forth, for what felt like an eternity. I was as at peace as a hyper child could be. One of my favorite places on earth is at my family’s cabin on Lake Sutherland. It was passed down from my father’s father to his four children and all of their children have been visiting it since we were little. My family and I would take a trip from Juneau, Alaska to Port Angeles, Washington almost every summer while I was growing up, usually we would drive down through Canada and then Seattle. Back when gas prices were much more reasonable. A lot of the time when we arrived in Port Angeles we would stay at the lake cabin (as we call it), or at very least we would go out there all the time. One little moment of joy in my life was when my Aunt gave me a key to the lake cabin when I moved to Seattle. Between the cabin and the lake there is a small area of grass and in that area there is a white stand-alone hammock permanently taking up space there. 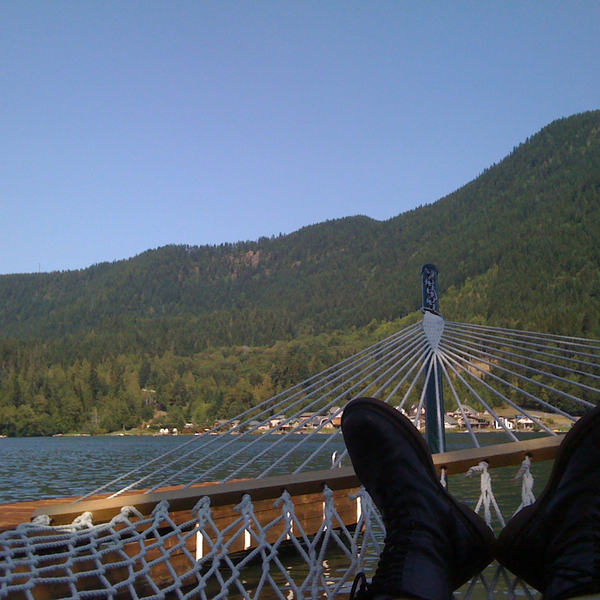 The last time I was there I took a picture of me in the hammock with it’s gorgeous view of the lake and other side. It’s one of the things I look forward to most about going to the lake cabin, that and jumping off the end of the dock into the water and swimming until my arms are tired. Hammocks bring me pleasure to my core. I don’t know if I could ever be upset in a hammock; they calm me and fill me with utter joy. There is something just so peaceful about laying happily in a hammock, rocking back and forth, suspending all the problems and potential stresses of day to day life by just taking the time to breathe and rock. Any time we see a hammock or someone references one I mention to Onyx that we need a hammock. When looking at cat towers for our four cats to play on I am always drawn to those with hammocks. Life is just better with a hammock to rest in and let troubles melt away. Someday I will have one. Until then hammocks will remain a once-in-a-while luxury. For the last few months especially I’ve been calculating a position regarding people in my life. Basically it’s this: if someone don’t make me feel good then I don’t want to be around them. Of course, there are times when life gets in the way and negative things happen, when I might feel sad or bad about something that is happening to the other person or a mistake I made, who knows. I’m not talking about those things, though, I’m talking about if, more often than not, joy is brought to my life because someone is in it. Selfish? Maybe. But I’m such an emotional sponge that I just can’t stand to choose to be around negative people. When around those types of people I become negative and depressed, my life has less joy, and what’s the point of living life without joy? I realize it may not always be my choice, but when it is I will choose not to be around them. It may sound simple and intuitive, and in some ways it is both of those. However, it has not always been simple or intuitive for me. I used to be attracted to people who were projects, by which I mean people I thought I could help or fix in some way. This also meant that I was, in many cases, the sole supporter or contributor in the relationship. I would give and give and give and the little scraps I got in return were just enough to sate me so that I could give some more. It took a lot for me to realize this, and I can’t say that every relationship I’ve ever been in was exactly the same, but a lot of them followed this basic pattern. Of course, there is much more to this pattern than I have really mentioned and there were lots of other things going on too, and I guess that makes it sound like it was all the other people’s faults and that’s not really what I mean. Analyzing the patterns is more of a job for another post, however. More interactions with he who I’m from now on referring to as Adam have lead me to believe that he is used to this type of relationship from me, even after a couple years of not speaking, which just reminded me of why I stopped talking with him in the first place. The curiosity and temptation have worn off for the most part and while I’m interested in interacting with him on some levels I’m just not sure how he fits in with my new philosophy. I am focusing on pleasure, which is also evidenced by the change of this blog title to Purveyor of Pleasure. Along with pleasure I’m focusing on joy and positivity. I am, in fact, dedicated to the cultivation of all of these things, and hope my actions and writings can help bring them to others as well. I’m Tai Fenix Kulystin a queer fat trans genderqueer polyamorous switch. Pronouns: they/them or any gender neutral . I started this blog in 2007 as my personal exploration of all aspects of my life and relationships, including gender, sexuality, spirituality, kink, polyamory, and pleasure. Queer Magic: Power Beyond Boundaries is Out Now!